There have been many fantasy novels written over the years which are set in a city which is meant to be more than just a place for the plot to happen, but is meant to be an integral part of the story itself. 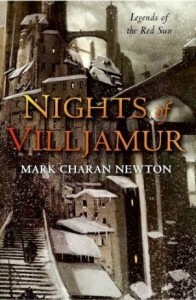 The latest attempt at a great city is the titular Villjamur in “Nights of Villjamur”, the first book in Mark Charan Newton’s “Legends of the Red Sun” series. Villjamur is an ancient city, built on the ruin of a long-lost civilisation and the capital of an Empire stretching across the Boreal Archipelago, a wintry chain of islands where life away from the cities is harsh and about to get much harsher as the islands prepare for the onset of what they believe will be a decades-long Ice Age. As the weather worsens, the rulers of Villjamur stockpile resources and food to sustain them during the long winter whilst outside the walls a growing number of refugees are setting up camp, hoping to be let into the city that fears to admit them, believing that resources are insufficient to feed everyone. There isn’t a single central plot-thread in the book, instead there are multiple characters all with their own plots and motivations which occasionally overlap with one another and it’s difficult to really say which plot should be considered the main one. One plot thread focuses on Inquisitor Jeryd, a member of the non-human Rumel race who share the city with humans who despite his non-human origins is in every other respect a traditional fictional detective, trying to solve the grisly and seemingly supernatural murder of a city councilman while dealing with his overly-ambitious aide, a conspiracy involving a banned underground religion and his unhappy love-life as he tries to win back his estranged wife. Another plot thread is centred around the seemingly carefree Randar Estevu, a young man from a remote tribe recently arrived in the city to work as the Emperor’s daughter’s dancing tutor who is secretly indulging in some seduction of wealthy widows and a bit of simple theft in an attempt to raise the money needed to pay for a cultist’s magical cure for his mother’s illness. The third major plot thread focuses on Brynd, the commander of the Night Guard, the Emperor’s elite bodyguard who are ambushed by a mysterious enemy during a mission to obtain some vital resources who also has to deal with the ambitious Chancellor Urtica’s war-mongering and investigating the mysterious disappearances of large numbers of people on one of the Empire’s outer islands. The final major plot features the rivalry between two of the city’s most powerful groups of cultists, cultists being the only people who know how to use the seemingly magical technology left behind by ancient civilisations. One consequence of having so many plot threads is that they can seem a bit disconnected from each other. For example, the Cultist plotline only has fairly loose connections to the rest of the story and by the end of the book has very little directly to do with Villjamur itself. Presumably, the plotlines will be better integrated in later books, since this is the first volume in a four-book series. Nights of Villjamur is Newton’s second novel, and at times that inexperience can be apparent. It is an ambitious work with a complex story, some impressive world-building and Newton’s writing seems to aspire to be higher quality than that of most fantasy authors. He is only partially successful in that ambition, most of the time the quality of the prose is fairly high but it can also seem a bit clunky on occasion, particularly with some awkward exposition early in the book. The dialogue is often a particular weak point, attempts at dramatic speeches often end up seeming a bit trite (for one example, the underwhelming scene where the Chancellor tries to rally the council to declare war on a rival nation) and attempts at everyday conversation sometimes don’t seem to flow naturally or convincingly. Another area where the book falls slightly short of its lofty aims is in the depiction of Villjamur itself. The world-building is intriguing and mostly described efficiently without excessive exposition after the initial introduction to the world. However, the descriptions of Villjamur itself are never quite as evocative as they should be and although the characters frequently remark on what a unique and awe-inspiring place the city is, the actual portrayal of the city fails to make it truly memorable. Characterisation overall is reasonably good, with a varied group of characters all of whom have believable motivations and distinct personalities. However, some of them don’t really get enough time to properly develop, even fairly important characters like the cultist leader Papus, the artist Tuya or the Emperor’s heir Rika largely remain enigmas throughout the book and some of the characters who do get a bit more time spent on them can seem a bit bland – Jeryd is a likeable character but the honest-but-troubled detective is more than a little bit clichéd and despite being non-human he never feels in the slightest bit alien. Probably the weakest bit of characterisation is the main villain, who ends up being a bit of an over-the-top caricature of a greedy and ambitious politician. The book is well-paced, getting quickly to the heart of the story without too much introduction and Newton does pack a lot of plot development into its 440 pages. Several of the plot threads are genuinely intriguing and compelling, the book building to a satisfying climax which provides a reasonable amount of resolution to some plot threads while leaving plenty of material for the sequels to explore. The world-building also hints at much greater depth to be revealed in later books, the world Newton describes is interesting and it has some fairly novel elements such as the stresses placed on the civilisation by the problems of the coming Ice Age, problems without any apparent easy solution. In summary, this is an example of a book that could have been great but has to settle for merely being good. The world is interesting and the plot intriguing and overall it is an entertaining read, but I feel that it might have been a better book if Newton had a few more years experience writing since the occasionally uneven prose and dialogue are flaws that many debut novels (or second novels, in this case) have. Hopefully the later books in the series will build upon the promising foundations of this novel.